This colour YardPro Nova Portal Frame 360A Workshop is the ideal building solution if you are a serious home handyman. This ultimate man cave has additional floor space and enough head height so you can comfortably move around while keeping the things that you love in safe. 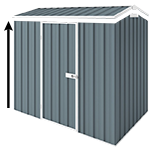 Hi Cheap Sheds, I'm looking at purchasing a yardpro 360. I'd like to add a couple of windows, but the accessories list states max 1. Is there a reason for this? Am I really restricted to 1 window? Cheers, Matt. Hi Matt, Thank you for your question. The Yardpro is engineered to just fit a maximum of 1 window to maximise stability of the structure. I hope this helps and if you have any questions please let us know. Thanks.